GARCIA-NAVARRO: All right. So what was last week's challenge? SHORTZ: Well, maybe it wasn't as easy as I said it was last week. I said take the letters S, Y, T, O, Y. Add the same letter of the alphabet six times to complete a familiar phrase. What is it? And you add E six times, you get see eye to eye. GARCIA-NAVARRO: We received more than 1,100 responses. And our winner this week is Nabil Tamer of Cupertino, Calif. Congratulations. TAMER: For me, this one was easier than the previous two weeks. I figured the missing letter had to be a vowel. And once I got to E, I saw the word see right away. And luckily, see eye to eye - the phrase - just occurred to me a few seconds later. GARCIA-NAVARRO: All right. And I hear you're a hiker. There's a lot of great regional and national parks in California. Do you have a favorite? TAMER: There's one not too far from where we live here in Cupertino called Picchetti. They've got a winery. When there's been rain, like there has been this winter, a pond forms. And we can see newts doing their thing in the spring. So it's kind of fun. GARCIA-NAVARRO: Oh, how cool. And how long have you been playing The Puzzle? TAMER: For at least 20 years because I was on the show 20 years ago in 1999. GARCIA-NAVARRO: Wow. That's amazing. Oh, cool. All right. Well, are you ready to play? GARCIA-NAVARRO: OK. Take it away, Will. SHORTZ: All right. Nabil, I'm going to give you two words. Think of a word starting with C-H. They can follow my first word and precede my second one in each case to complete a compound word or a familiar two-word phrase. For example, if I said dirt and skate, you would say cheap because that completes dirt cheap and cheapskate. TAMER: OK - I think so. SHORTZ: Number one is rocking, lift. SHORTZ: Rocking chair, chairlift is right. Number two is blank, mark. SHORTZ: Blank, blank and then the blank mark. SHORTZ: That's it, good - flow, F-L-O-W, and topper. TAMER: Flowchart and chart topper. SHORTZ: That's it - wind, pill. TAMER: Chill wind and wind chill. SHORTZ: Wind chill and chill pill is right. SHORTZ: You got it - lucky, bracelet. TAMER: That's got to be charm. SHORTZ: That's it - fire, F-I-R-E, and justice. TAMER: Fire - it's not coming to me. SHORTZ: And what's blank justice starting C-H? TAMER: Thinking blind justice, but that doesn't start with C-H.
TAMER: I don't know it, sorry (laughter). SHORTZ: John Roberts of the Supreme Court? TAMER: Oh, oh, chief justice. Oh, my God (laughter). SHORTZ: Chief justice and fire chief is it, good - treasure, protector. SHORTZ: That's it - cover, card. TAMER: Oh, a cover charge and charge card. SHORTZ: That's it. That's it - say, S-A-Y, and board, B-O-A-R-D.
SHORTZ: Wild, pick - P-I-C-K.
SHORTZ: Wild cherry is it, good - that fruit. How about echo, music? SHORTZ: Uh-huh - spring, feed. SHORTZ: That's it - clam, head. SHORTZ: That's it - spell, board, B-O-A-R-D.
SHORTZ: That's it, good. And your last one is milk, chip. TAMER: Chocolate milk, chocolate chip. Wait, that's the same. SHORTZ: Milk chocolate and chocolate chip. SHORTZ: You got it. You got it. TAMER: It works either way. GARCIA-NAVARRO: That was - you were great. How do you feel? TAMER: I'm glad it's over (laughter). GARCIA-NAVARRO: (Laughter) Relieved - all right. Well, for playing our puzzle today, you'll get a WEEKEND EDITION lapel pin, again, as well as puzzle books and games. You can read all about it at npr.org/puzzle. And which member station do you listen to? TAMER: I listen to and I'm a member of KQED in San Francisco. GARCIA-NAVARRO: Nabil Tamer of Cupertino, Calif., thank you for playing The Puzzle. TAMER: Thank you so much. GARCIA-NAVARRO: All right. Will, what's next week's challenge? SHORTZ: Yes. It comes from listener Steve Baggish of Arlington, Mass. Think of a well-known brand name in eight letters starting with H. Change the H to an M, as in Mary, and drop the last letter. You'll get another well-known brand name in seven letters. What commercial names are these? So again, well-known brand name, eight letters starting with H, change the H to an M, drop the last letter. And you'll get another well-known brand name in seven letters. What commercial names are these? GARCIA-NAVARRO: When you have the answer, go to our website npr.org/puzzle. And click on the Submit Your Answer link. Remember. Just one entry per person, please. Our deadline for entries is Thursday, March 28 at 3 p.m. Eastern. Include a phone number where we can reach you at about that time. And if you're the winner, we'll give you a call. 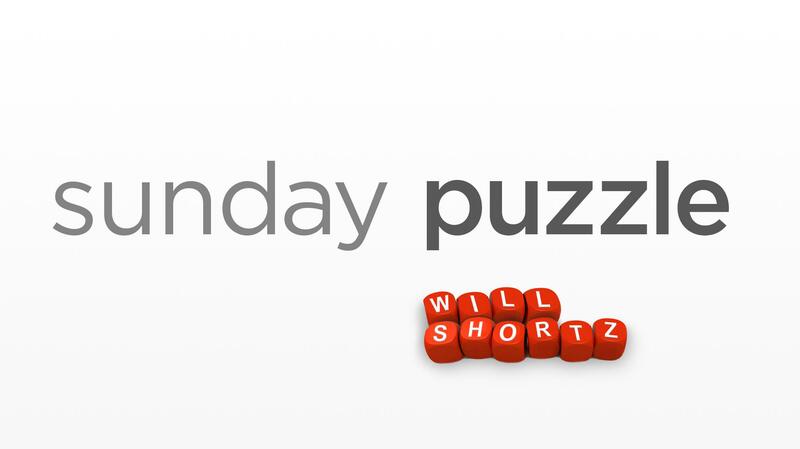 And you'll get to play on the air with the puzzle editor of The New York Times and WEEKEND EDITION's puzzlemaster, Will Shortz. Thanks so much, Will.